Intel is punting a new modular server kit that's based on standardized parts for system builders and OEMs who cater to small and mid-sized businesses. 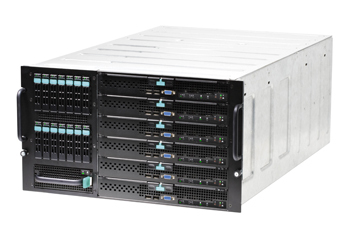 The platform, dubbed Intel Modular Server, uses blade server specifications announced by the Server Systems Infrastructure (SSI) organization last July. The gist is, when possible, letting builders use standardized off-the-shelf components in order to lower the cost of making the systems. Intel's platform is based on a 6U chassis that holds up to six dual- or quad-core servers, 14 hard disk drives, two Ethernet switch modules, an integrated storage attached network, and a management module. What a builder gets is the chassis, a motherboard, a switch and failover. Resellers then stuff the box with the hardware and sell it off. The platform offers plenty of scalability in the system— and of course upsell opportunities for vendors. The building blocks Intel supplies are based on its Multi-Flex Technology, a set of management and storage tools. This includes virtual storage mapping, battery health management, single sign-on, resource allocation layout, integrated storage area network, real time volume expansion and diagnostics. Intel is hoping the platform will make a splash with local system builders that rely more on modularity to customize their gear for customers. The price, of course, should vary greatly depending on what's inside.